The author, broadcaster and campaigner Sir Ludovic Kennedy has died aged 89. A former BBC Panorama journalist, Sir Ludovic spent decades investigating miscarriages of justice, including the case of the Birmingham Six. He contributed to the abolition of the death penalty and was also president of the Voluntary Euthanasia Society. He is understood to have died on Sunday at a nursing home in Salisbury, Wiltshire, after contracting pneumonia. He leaves four children. Sir Ludovic was married to ballet dancer and actress Moira Shearer - star of the Classic film The Red Shoes - for 56 years, until her death in January 2006 at the age of 80. The couple had one son and three daughters. Tributes have been paid by senior figures in the worlds of journalism, law, politics and campaigning. As a young man, Sir Ludovic joined the Royal Navy and his ship HMS Tartar was involved in the sinking of the German battleship Bismarck. After the war, he attended Oxford University and went on to become a successful journalist. During his career, he carried out his own investigations into a number of high-profile criminal cases. Among them was that of Derek Bentley who was hanged for shooting dead a policeman even though someone else pulled the trigger. His most famous book, 10 Rillington Place, caused a national outcry when it argued that another executed man, Timothy Evans, did not murder his baby daughter. Sir Ludovic maintained that the serial killer John Christie was responsible, and after a police inquiry, Evans was granted a posthumous pardon in 1966. Human rights lawyer Gareth Pierce - whom Sir Ludovic worked with on a series of miscarriages of justice - said he was "profoundly committed" to the cases he took up. "He sustained his commitments until they were victorious," she said. Defence lawyer Joe Beltrami, who also worked with Sir Ludovic, said he was the last of the great campaigning journalists but was "very modest". "He had great determination to win and he won more often than he lost. I admired the man." 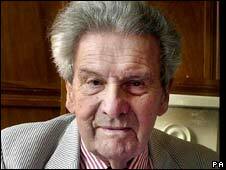 Mark Thompson, director-general of the BBC, called Sir Ludovic "one of the giants of post-war broadcasting. "His integrity and the tenacity of his investigative journalism, particularly where he saw injustice, won him the respect and trust of generations of audiences," he said. For much of his life, Sir Ludovic was a member of the Liberal Party and its successor, the Liberal Democrats, and stood unsuccessfully as a Liberal candidate in 1958. He quit the party in 2001 when the then leader Charles Kennedy refused to endorse assisted dying, and stood for Parliament again unsuccessfully as an independent candidate on a pro-euthanasia platform. He later rejoined the Lib Dems and current leader Nick Clegg paid tribute to him. "Ludovic Kennedy was one of the great thinkers of his generation," he said. "His pursuit of justice and his championing of sometimes unpopular and controversial causes marked him out as a true liberal." Scottish First Minister Alex Salmond said Sir Ludovic was "an outstanding broadcaster". "He was a lifelong free-thinking member of the Liberal Party, but he was also a long-standing advocate of Scottish independence, and in later life he frequently endorsed SNP campaigns," he added. Mr Salmond said although Sir Ludovic had "friends and admirers across the political spectrum, no one doubted his journalistic integrity and independence". Richard Ingrams, co-founder of satirical magazine Private Eye, said that while Sir Ludovic had connections with the Liberal party - and "a very impeccable establishment background" - he was really "a bit of an anarchist". "For somebody like that to be engaged in the exposure of miscarriages of justice - it gave him an advantage," he told the BBC. "He couldn't be dismissed as a kind of left-wing lunatic or anything like that." Sarah Wootton, chief executive of Dignity in Dying - formerly the Voluntary Euthanasia Society - said the organisation was saddened. "He was a passionate advocate of assisted dying for terminally ill people, whose compassion and vigorous intellect were an asset to the organisation," she said. Edinburgh-born Sir Ludovic was a prominent supporter of the British Humanist Association (BHA). BHA chief executive Hanne Stinson said he was a "progressive campaigner on many fronts" and would be "sorely missed". We asked for your memories of Sir Ludovic Kennedy. Please find a selection of your comments below. I met Ludo on several occasions with my husband, Michael Mansfield QC. Ludo was a committed, passionate fighter for justice. He was also a caring, warm and deeply humane person. We shall miss him sorely. He was one of the most inspirational broadcasters and writers of his day. He had high intellect, but a sense of justice which allowed him to argue for the common man, in a language which all could understand. A tremendous loss for all those of us who have been inspired by his words and his charm over the last 50 years. Another great broadcaster and debater of the BBC gone. A great loss. Sir Ludovic or 'Ludo' was my grandmother's cousin on the side of Sir Ludovic Grant, 11th Baronet of Dalvey, and I am proud to be related to this compassionate man who did so much for so many...may his legacy live on! Ludovic Kennedy was one of the great moral thinkers of our time. His view of the world reflected most closely the rationalist and humanist foundation upon which those of us born just after the war - the baby-boomers - developed our philosophy of positive liberty outside of a religious straightjacket. We owe him a great deal - he made sense of the world when it appeared to be senseless. In the 1930s Ludovic penned some words in the form of a jazz song called No Admittance Except On Business but couldn't afford the £12.12.0d fee to have it set to music. I came across the lyrics in his autobiography On My Way To The Club and as a musician/composer set it to music, recorded it and sent it to him for his 75th birthday. Quite a few weeks went by without me receiving a thank you and I was therefore feeling somewhat miffed but in due course a very nice but amusing letter did arrive. The funny part is, from a man so fastidious as Ludo, he had misplaced my letter and address and when he put the cassette into his music centre it unravelled and became ruined! I still have three kind letters that he wrote to me and I still own the song and I therefore have a very fond memory of him. Sir Ludovic Kennedy served with my Grandfather, Captain L.P.Skipwith R.N. on HMS Tartar during the war and I met him when he attended my grandmother's funeral. It was a great privilege to have met him. He was a remarkable man in so many ways. In this day and age, people of his calibre are very, very rare. I know someone who served with him on Russian convoys during the war. The smell of his Turkish cigarettes used to come up the speaking tube to the bridge. He used to curse him - very affectionately. One of the old-style BBC broadcasters, which is how I knew him. I trusted him because he made me feel he had thought deeply about whatever he was saying to me, contrasted with the current generation who are just good at reading an autocue. I wrote to Sir Ludovic in 1986 after reading his book "The Airman and the Carpenter" (about the Lindbergh Kidnapping Case) and realizing that my grandfather had been a close friend of Bruno Richard Hauptmann, the man who was executed for the crime. I found Sir Ludovic to be a patient and sympathetic listener who was determined to learn the final truth about the crime. Although we did not agree on the possible motives for the crime, his reasoning and knowledge were extremely impressive and I became an instant admirer of his. Ludo's death is a gigantic loss to British society and, for the most part, sadly it almost certainly won't know why! His particular sense of values, in my opinion, is one that must continue in order to breathe life into a system which needs inspiration, not moral stagnation, nor a temporary knee-jerk reaction to society's difficulties. What a man! My memory of Sir Ludovic Kennedy was when he was an invited guest at a naval reserve dinner at Newcastle- upon-Tyne. He was a wonderful speaker, he had great sense of humour and quick wit, and an enthralling manner when describing naval action. I observed that he was admired by naval officers of his generation and those much younger, and I left the dinner feeling a great appreciation for his knowledge and ability to entertain and inform his listeners. Ludovic Kennedy was one of the first public men to make an impact on me. His blazing intellectual honesty and curiosity were an example to me when I was young , and his unquestionable integrity was an example to all. The world was a much better place for having him in it and is now so much poorer.